Chuck Hull found retirement was not for him so he returned to 3D Systems and is now vice-president and chief technology officer. Although measured and deliberate in his responses, there is one moment when the softly spoken Chuck Hull – known as the father of 3D printing – tells of his surprise about what exactly his creation was capable of achieving. In 1996, surgeons at the Wilford Hall medical centre in Texas working to separate a pair of conjoined twins thought that only one would be able to walk after the operation. After a model of the girls’ bone structure was generated using 3D printing, however, they found a shared upper leg bone to be bigger than expected and split it successfully, resulting in both twins being able to walk. 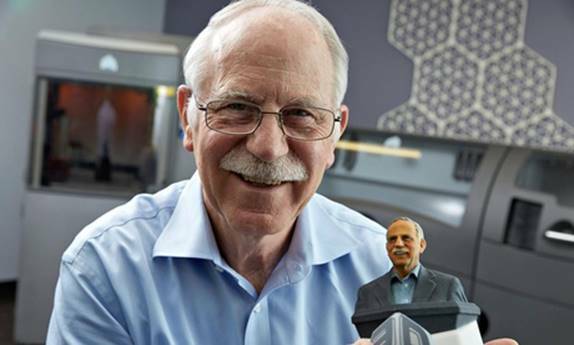 Now 75 and still working as chief technology officer of 3D Systems, the company he co-founded, Hull is enjoying some minor celebrity 31 years after he first printed a small black eye-wash cup using a new method of manufacturing called stereolithography, now known as 3D printing. At the time, he was working for a company that used UV light to put thin layers of plastic veneers on tabletops and furniture. Like others within the industry, he was frustrated that the production of small plastic parts for prototyping new product designs could take up to two months. He had an idea that if he could place thousands of thin layers of plastic on top of each other and then etch their shape using light, he would be able to form three dimensional objects. After a year of tinkering with ideas in a backroom lab after hours, he developed a system where light was shone into a vat of photopolymer – a material which changes from liquid to plastic-like solid when light shines on it – and traces the shape of one level of the object. Subsequent layers are then printed until it is complete. After patenting the invention in 1986, he set up 3D Systems in order to commercialise the new method of production and went on the road to secure both funding – eventually getting $6m (£3.5m) from a Canadian investor – and customers, using videotapes to show the equipment. The first commercial product came out in 1988 and proved a hit among car manufacturers, in the aerospace sector and for companies designing medical equipment. When Hull originally came up with his invention, he told his wife that it would take between 25 and 30 years before the technology would find its way into the home. That prediction proved correct as the realistic prospect of widespread commercial 3D printers has only emerged in recent years. The possibilities appear endless – from home-printed food and pharmaceuticals to suggestions that pictures of ceramics will be able to be taken in shops and then recreated using plans downloaded from the internet. Hull, an unassuming man who has 93 patents to his name in the US and 20 in Europe, says he is “humbled” by the possibilities but stops short of predicting what his technology could eventually deliver, although he is confident printers could soon be in every home. “It’s nice to get some recognition, it was a lot of hard work but other than that I just keep working,” he said last week in Berlin, where he received a European Inventor Award. Controversy has arisen with the possibility that guns will be able to be produced using 3D printing, again using blueprints downloaded from the internet. A group called Defense Distributed last year successfully tested a 3D printed gun in Texas. Hull said: “My first thought is that people messing with that – I hope they don’t hurt themselves. Building and testing guns of that nature could be dangerous. I think the people doing that were trying to make a point. After finding that retirement was not for him, Hull returned to the company he co-founded and is now vice-president as well as chief technology officer, and holds shares worth $20m (£12m). Last year, 3D Systems brought in revenues of more than $500m (£294m) and has three bases in the UK, in Hemel Hempstead, High Wycombe and Clevedon. New systems of 3D printing have emerged over the years and various other firms have been added to the 3D Systems stable. Last week the company launched the Ekocycle Cube printer in a collaboration with the singer Will.i.am, named chief creative officer in January, which is touted as being for everyday use and priced at $1,199 (£705). Stepping down is not an option at the moment for Hull, who declares the products of 3D printing, now including ranges of jewellery, as “all his children”. Future projects include working with Google on the company’s next generation phone. On a small plot in the north of Amsterdam, architects are building what they hope will be the first 3D-printed house. They are laying blocks that have been printed using a scaled-up version of an open-source 3D printer to be stacked like Lego bricks – one of the more elaborate examples of what can be produced using 3D printing. The recent Consumer Electronics Show in Las Vegas showcased printers that could produce foods such as ravioli and chocolate printed patterns, while Harvard researchers have recently unveiled what they say is the first 3D printed battery, which can be constructed in minutes. • Will your next phone be 3D? Amazon’s new Fire Phone uses a system of four cameras to constantly track its user’s face and makes objects appear 3D using “dynamic perspective” – shifting the image around as the user tilts their head. Users can nod and use other gestures to navigate the phone too, which uses Amazon’s own version of the Android software. But a camera on the back that can instantly recognise objects, books, art and goods is the killer feature for the online superstore. Point the phone at a book, snap a picture and buy it from Amazon with one tap. Yet another attack on the high street. • Paranoid about drones watching your every move? The personal drone detection system could be for you. The black box, which claims to beep when a non-military drone flies within 15 metres of it, is available on the crowd funding site Kickstarter. What you actually do about a drone intruding on your airspace is left to you. • Yo! A single word that has gone viral thanks to a stupidly simple app. The Yo app for Android and iPhone literally just sends the word “yo” to friends, contacts or complete strangers. One word can mean so many things with the right context, enough to earn the free app’s creators more than $1m (£588,000) in funding at least. • Microsoft has taken strides towards delivering longer battery life. The software giant has launched new wireless charging smart trousers that power up your phone while it’s in your pocket. Designed by British fashion designer Adrien Sauvage for the “Modern Man” (what about the rest of us? ), the trousers use inductive charging to power a Nokia Lumia smartphone without wires. Never be left with a dead phone battery again. • What do the Vulcan salute, a chipmunk and chilli have in common? They are all brand new emoji – small cartoons of objects that can be sent instead of words. More than 250 new emoji have been added to the Unicode 7 specification, which defines how text is handled or expressed in computer programs. The little characters could soon be winging their way across your chat apps, email, internet and Word documents.